SATCOM is going to be delivered by Airbus Defence and Space to the UK Royal Air Force’s Red Arrows tour of the Asia-Pacific and Middle East which will include more than 20 flying displays. 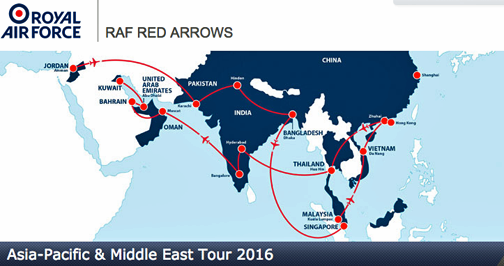 The 12 Hawk T1s of the Red Arrows based at RAF Scampton will be performing displays and a series of flypasts across the Asia-Pacific and Middle East regions throughout October and November 2016. The Skynet constellation will provide all assured voice and data communications throughout the tour, primarily through the newly relocated Skynet 5A satellite, and the Airbus Defence and Space managed anchor station in Adelaide, Australia, which was opened in May 2016, in partnership with SpeedCast. Airbus Defence and Space announced in September of 2015 the successful completion of the 67,000 km move of the Skynet 5A satellite from 6 degrees East to 95 degrees East. The relocation extended the Skynet constellation’s coverage and services from 115 West to 163 East, including the Indian Ocean and Western Pacific region. With the move complete, the Skynet network offers global military X-band and UHF coverage, expanding core service reach for the UK military and augmenting coalition capabilities in the region. Artistic rendition of Skynet satellite.